I've been looking into buying an Airstream Sport Trailer and need to find the towing capacity of the PT Cruiser. I tried the original PT Cruiser website through the Internet Archive, but there was no information about it's towing capacity. An online search comes up with anything from 1000 up to 2500 lbs. If I'm reading their brochure right, the base weight of the 22' trailer is about 500lbs, and they say to add another 1000lbs to that for personal items, water, gas etc. I need to get a tow hitch installed as well. So does anyone know what the tow capacity of a 2004 Ltd Platinum Ed PT Cruiser Turbo is? Re: PT Cruiser Towing capacity? Everything I have seen shows 1000 pounds. 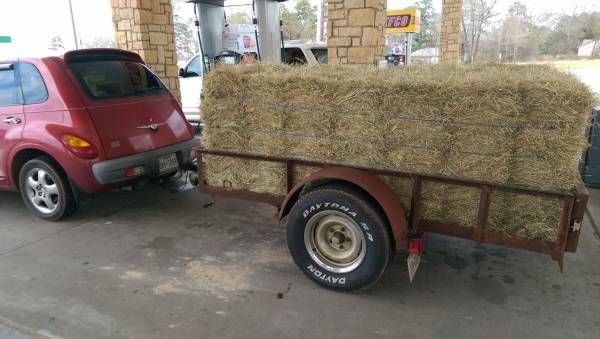 Mine is a 2001 and have pulled a 5x8 trailer that weighs about 450 pounds with 21 bales of hay. Total weight is about 1500 pounds. No problems pulling it. I will say that it is mostly flat terrain and I am pulling about 20 miles total. I'm going to have to put off buying the trailer though, my Cruiser was overheating today on the way to school, not I have to figure that out! The towing capacity for a 2006 PT with any engine and any trans is 1000 lbs. The 22' Airstream Sport weighs over 4000 lbs slightly loaded. No chance. A good tow vehicle for that camper would be a dodge half ton pickup with 4WD. V-6 for flat terrain. Small V-8 for hills. Remove the back seats. Cut a chunk of cardboard and use it as a floor mat. Then slide in 4 more bales. It would make a nice Valentines Day gift for the livestock. Back seats have been out since I got it. I keep a tarp in the back for those times. You overload the PT by hauling something that heavy for very long and odds are good that you'll burn the transmission up. Even if you add a separate trans cooler to it. I wouldn't risk it, if it were me. My guess is that the BMW brakes are better/bigger than PT brakes. Mine are more than adequate. Whenever the trailer weighs more than the tow vehicle, it concerns me. Towing on back roads at 30 mph is much different than towing on a 65 mph highway going up a long hill. Exhaust manifolds can crack, gaskets blow out, cooling systems must be in top shape, etc. When the old half-ton slant six, 3 speed standard truck was overloaded with pea stone, it pulled well in second gear up the hill, but when I tried to pull into the driveway [slight downhill] I missed it by 200 feet. It wouldn't stop with over a ton in it. But it didn't look like much when they poured it in. If you get caught overloaded, the fine used to be $500 plus 50 cents a pound. Don't know what it is now. There is a difference between what a vehicle is capable of and what a manufacturer is willing to guarantee for liability reasons.